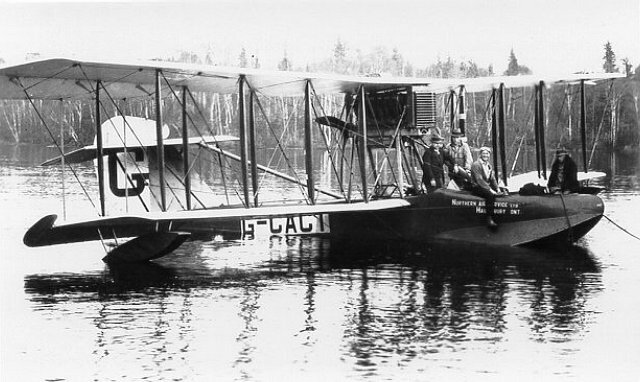 Vickers Viking flying boat, G-CAEB, purchased in June 1922 by Laurentide Air Service. Photo: Canada Aviation and Space Museum #1828. A recognized historian of Québec aviation, George Fuller makes his first appearance on Flights of History as a guest author. Another first – this post is the first to be published on this blog in both French and English. 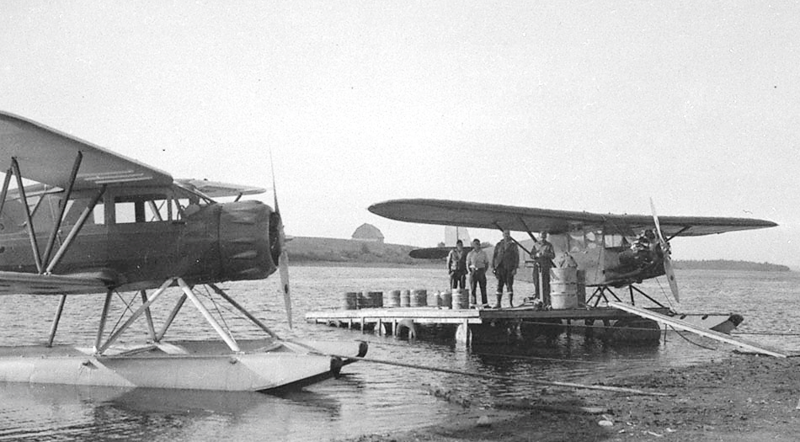 The aviation history of the Outaouais region of Québec goes back nearly 100 years to the days following the First World War when war surplus aircraft became available at modest prices. To encourage all readers to explore this rich history for themselves, I have compiled this overview covering the period from 1919 to 1970 to provide a starting point. Based on extensive reference notes I have made over the course of 60 years, this brief survey lists some 75 commercial aviation operators and their major clients, as well as more than 130 aviation sites in the Outaouais and adjacent regions. Representative aircraft are shown for each of the operators, illustrating the variety of aircraft types flown in this part of the province. Aircraft are also listed separately, by manufacturer and type name or designation. Addresses and years of operation are given for the various commercial aircraft operators. Representative aircraft are also listed for each operator. Unless otherwise indicated, locations are in Québec. In many cases, historic place names have been retained. Bases on the Rivière Harricana at Amos and on Lac Osisko at Rouyn. 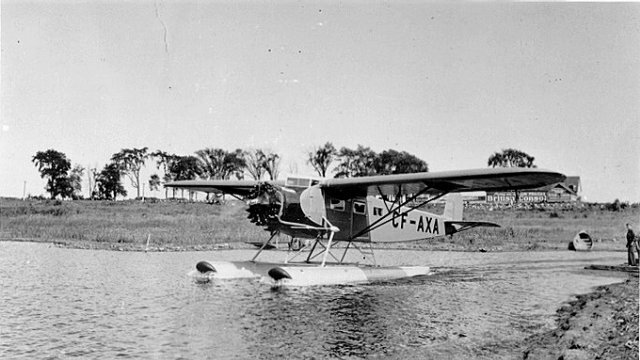 Amphibions P-2 Privateer, CF-APU, amphibian flying boat operated by Chambers & Rowntree Ltd. of Montréal. Photo: Canada Aviation and Space Museum #KM799. Flying from the frozen Lac Robertson near Taschereau, did photo survey in 1925. Exhibition flying at Chénéville. This aircraft was wrecked in collision with an automobile, killing the driver. In 1920, flew from North Bay ON to Mattawa ON, then followed the Rivière des Outaouais to New Liskeard ON. Company operated at Ottawa ON, and at Maniwaki and Amos. Client of Fairchild Aviation Ltd. for operations in the area. Operated charter service in 1934, from Toronto ON to the Rouyn area. Company Director C.W. McLeod was publisher of the newspaper “Val d’Or News”. Chartered in 1931 to fly Athanase David, Provincial Secretary in the Québec National Assembly, from St-Hubert Airport to his home at Ste-Agathe. This mining entrepreneur pilot had his operating headquarters at Senneterre in 1933. In 1929 this flying boat visited Rockcliffe ON and later may have carried freight from St-Félicien to the Obalski mining operations in the Chibougamau area. This aircraft covered a large area of Québec on exploration work. Although its principal base was at St-Félicien, this company probably was a regular operator in the area. CF-AEJ, Travel Air SA-6000-A, in service with Curtiss-Reid Airways from 1929, later owned by Starratt Airways, and subsequently by Canadian Pacific Air Lines. Photo: Library and Archives Canada #PA-014840. Based at Gray Rocks Inn, Lac Ouimet. The prominent first operator of the Norseman, the company had bases at Rouyn (Lac Osisko) and Senneterre. Operating briefly from a field on the Allen Farm on the Aylmer Road. Operated bi-weekly service between Haileybury ON and Rouyn. G-CAFD, Aeromarine AMC flying boat operated by Elliot-Fairchild Air Transport Ltd. between Haileybury ON and Rouyn. Photo: Canada Aviation and Space Museum #KM245. Called in to assist the over-booked Fairchild organization in Canada to conduct a photo survey for a projected power line to connect newly completed Gatineau Power generating stations with the Ontario Hydro-Electric Power Commission grid. This aircraft’s 1926 tasks included photographic operations in the Ottawa Valley, and vertical photography of an area on the National Transcontinental Railway northwest of Parent Station as well as the area north of La Tuque and east of Trois-Rivières. 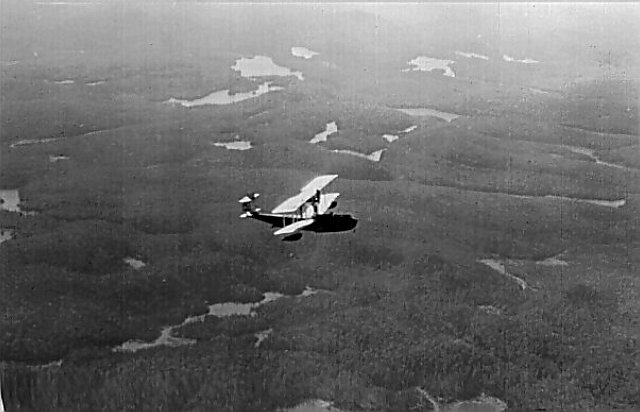 Summer 1927 operations included forest-fire protection patrols of the Canadian International Paper Company timber limits in the Gatineau river basin between Blue Sea Lake and Clova. In 1937 operated daily service from Rouyn to the gold mining area of Val d’Or. Freighting from Oskélanéo to the Chibougamau area. This important operator’s activities are too extensive to summarize here. On the right, G-CAIU, Fairchild FC-51, in 1933, when owned by Prospectors Airways. G. B. Explorers purchased this aircraft in 1936. 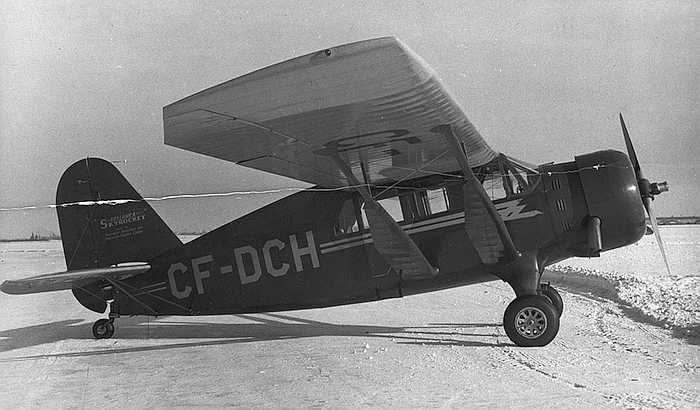 A Waco UIC, CF-AUC, owned by B.S. Ashley, is shown on the left. Photo: Kenneth Molson, Library and Archives Canada #PA-102022. Glyn Burge is believed to have operated from Haileybury ON and Senneterre. Gamble was vice-president of Granada Gold Mines Ltd., Rouyn. In 1937 he set up Speculations Ltd., also in Rouyn. Registered to Speculations Ltd., the Moth operated as far north as James Bay. A major client of the Fairchild companies. Major operator in the area with bases at Amos, Rouyn, Oskélanéo and Hudson ON. Bases at Amos, Lac Bachelor and Rouyn. Operating from Lac Ouimet and its adjacent airport. Apparently operations ceased when this leased aircraft was destroyed by fire. CF-DCH, a Bellanca Senior Skyrocket, shown here c.1947, was operated by Gold Belt Air Service in 1952-53. Photo: Russell Baker, Library and Archives Canada #PA-102390. This company operated two Moths and three Avro Anson V aircraft for charter and freight. The Hennessy brothers were contractors and prospectors, operating aircraft from both Hudson ON and Oskélanéo. Their aircraft served posts at Casey, Grand Lac Victoria, Oskélanéo, Senneterre and Waswanipi. Parent company of the Canadian International Paper Company and the Gatineau Power Company, served by the Fairchild companies. Specializing in forestry inventory and aerial sketching, associated with the Fairchild companies. Charter and freight operator. Absorbed with Air Fecteau in 1981 into a new company, Propair Inc. of Rouyn-Noranda. Did passenger carrying and pleasure flying. 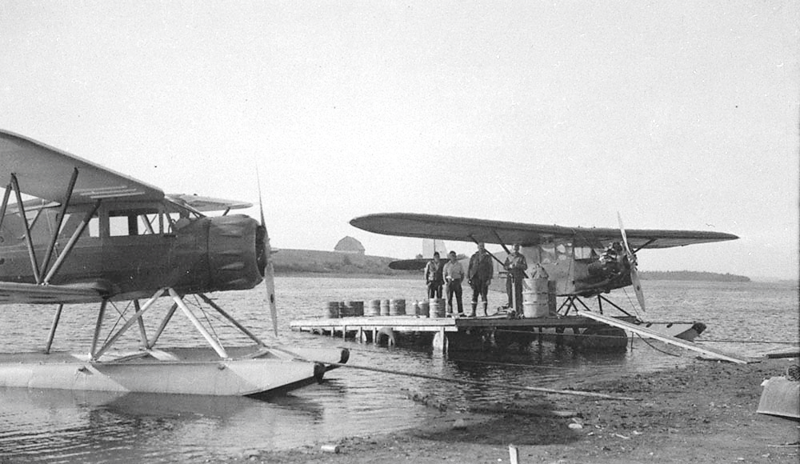 Bases at Ottawa ON, Ste-Marguerite (Domaine d’Esterel), and Squaw Lake (Schefferville). Flew from Lac-à-la-Tortue to Lac Kewagama (now Preissac) in 1920 to establish a mining claim, the first such operation in Canada. Bases at Grand-Mère (Lac-à-la-Tortue) and Rémi Lake (Moonbeam) ON. “Barnstorming” and passenger flying in Québec as far east as Trois-Rivières. Based at Leaside ON and New Liskeard ON, took and marketed aerial photos of Québec regions. Based at Schumacher ON. Owner of Belleterre Québec Mines Ltd., Belleterre (1936-48). Active in the western Québec mining area, W.N. Millar was a commercial pilot, related to the Weaver family from which Waco got its name. Mohr was part owner, with J. Nash and Louis Bisson. Associated with Waite-Amulet Mines Ltd., Rouyn area. 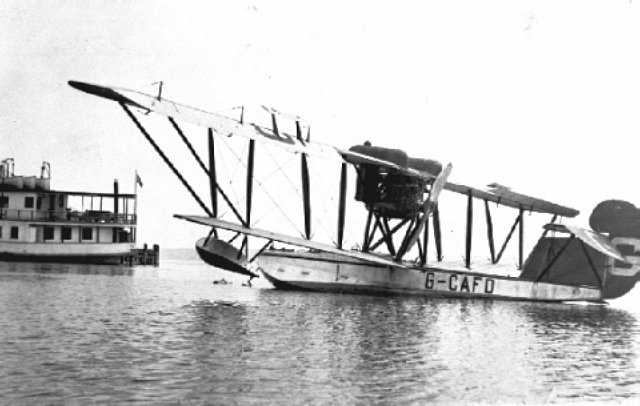 G-CACT, Curtiss HS-2L flying boat, operated by Northern Air Service Syndicate in 1925. Photo: Canada Aviation and Space Museum #2178. Nash was part owner, with R.S. Mohr and Louis Bisson. Operated in the Amos area. Manager/pilot was Bratislav “Bret” Pliske. 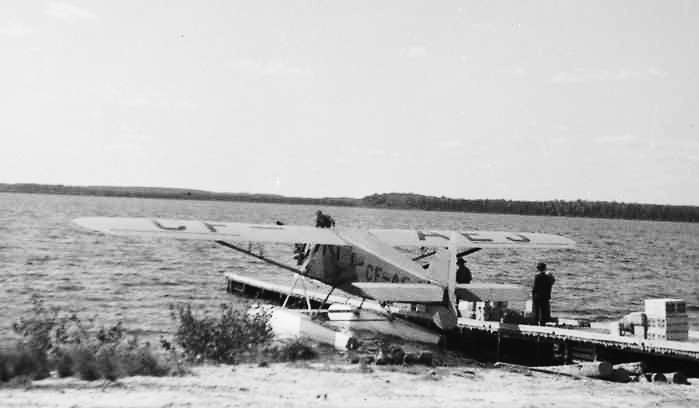 Operated service between Haileybury ON and Lac Trémoy (later Osisko), Rouyn; pilot, B.W. Broatch. Crash of this airplane resulted in considerable litigation. Itinerant operator working as far north as Lac-des-Sables at Ste-Agathe, offering pleasure flights. Based at Sioux Lookout ON. Passenger flights to Rouyn in April 1927 from Haileybury ON. Company president was Robert Cockeram (see above). Ranged as far north as the Ungava region. Prospectors Airways’ Fairchild FC 82, CF-AXA. Photo: Canada Aviation and Space Museum #4681. Owners Adélard Raymond and Harry Wilshire. One of their then-unregistered JN-4 biplanes, named Raymondale, made the first aircraft landing at Lachute on 13 November 1919, piloted by Harry Wilshire. It was probably the first commercial aircraft operated in the Montréal area. Jointly owned by Sam Coffler of Toronto and Joseph Dunkelman of Rouyn, operating as Rou-anda Air Services. Operated daily scheduled service between Montréal and Kirkland Lake ON with stops at Val d’Or (Sullivan) and Rouyn in 1937. Absorbed into Dominion Skyways Ltd. (see above). If you have memories to share or further information to contribute on the topics covered in this post, you are invited to do so via the comments box below. THIS IS AN INVALUABLE SOURCE OF AVIATION INFORMATION. HAT’S OFF TO YOU FOR COMPILING IT.DID YOU KNOW THAT H. WILSHIRE ENDED UP AS AN AVIATION REP FOR THE FORD TRI-MOTOR UNDERTAKING. I FOUND A REFERENCE TO HIM ONE ONE LANDED AT TORONTO LEASIDE ON A FLIGHT ARRANGED BY TFC & EARL HAND. SEE YOU IN CALGARY AT THE CAHS CONVENTION…JUST SUBMITTED A PAPER FOR CONSIDERATION ON THE PILOTS, PLACES AND PLANES OF THE RED LAKE GOLD RUSH! Glad to hear that you appreciated this joint effort with Diana that appeared on her blog. There is a single entry for him: “Wilshire HD, Harry Dugdale, (born) 13 August 1893; (the rest is archive file numbers). Worth sharing. I am looking for a source or reference on the bush plane pilots who flew for Fecteau Airbase in Chibougamau in the 1950’s? I was boy of 10 and I can only remember one family name, Gauldry, but I’m not even sure if that is the correct spelling. If Mr. Lemire can get access to the following book I am sure it will delight him: Fecteau, Thomas et Françoise Gauvreau-Fecteau, “Au-dela du 48ième parallele, mémoires d’un pilote de brousse du Québec.”. Saint-Séverin-de-Beauce, Québec, 2009. Let me add another little book: Dorion, Nicole. L’aviation civile au Québec. L’aventure des Fecteau, pilotes de brousse. Ste-Marie-de-Beauce, Société historique Nouvelle-Beauce, 1994. 36 p.
Dear George Fuller and Diana, Valuable info and fantastic photos — I remember those Gold Belt planes on Lake Osisko and took my first flight in one at 10 days old.